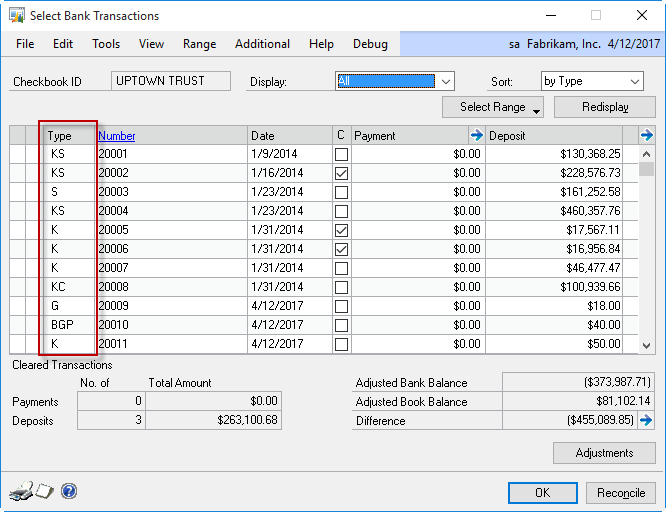 Advanced Filters add additional methods for sorting and restricting data in the Banking windows. 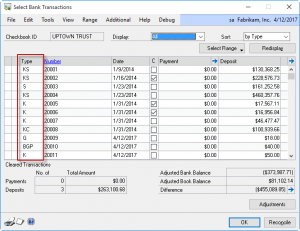 Additional information about transactions is displayed on the Banking windows to reduce the time it takes to locate specific documents. Advanced Filters provide several additional methods for searching, sorting, and restricting the list of deposits. 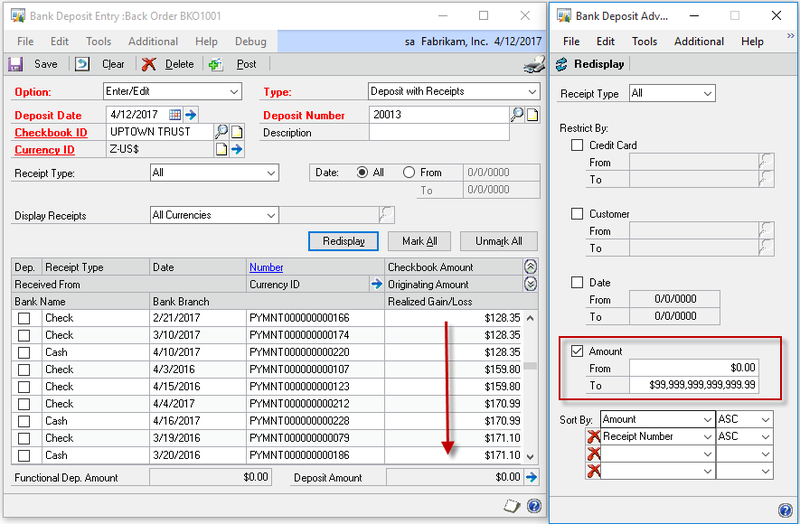 You can quickly sort deposits by dollar amount (as shown above), or display only AMEX deposits with the Credit Card restriction. 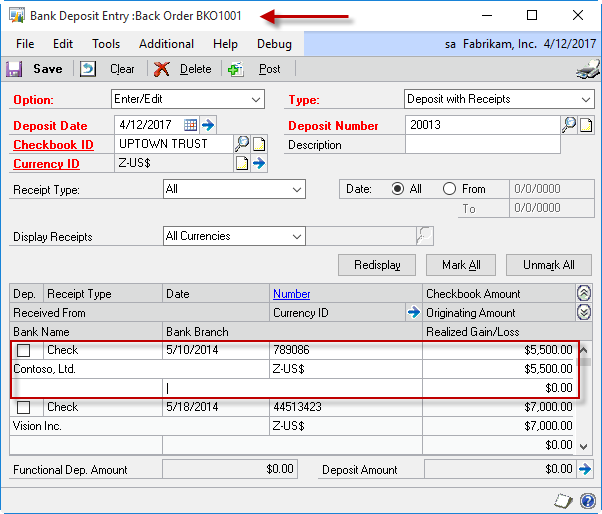 To help find a specific deposit, when a document is selected in the scrolling window, the Transaction Description will display in the title bar. 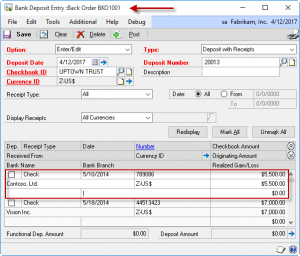 The number of codes displayed in the TYPE column is expanded to provide more detail about deposits. Rather than simply showing DEP for each deposit, the Type field contains a code indicating the type of cash receipt(s) contained in the deposit. 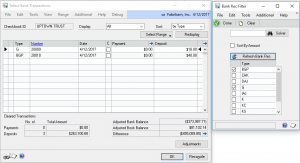 Advanced Filters provide the ability to restrict the Bank Rec window by any of the Type codes. Use Filter to quickly restrict the window to show only credit card deposits. To speed research, selecting a document in the scrolling window displays the Transaction Description in the title bar. Auto-Zoom automatically refreshes an open zoom window when you click on a new document. For example, once the Bank Deposit Entry Zoom window is open, each time you click on a deposit in the Bank Rec window, the zoom window will re-display to show the newly selected deposit. This saves a lot of clicks over having to repeatedly select a document then click the Zoom button. 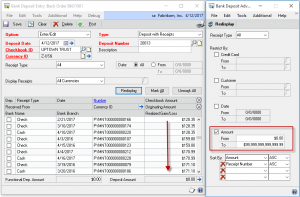 The Excel Solver integration provides a solution for a very complicated problem–how to find a set of deposits which total a specific amount. You might have individual Credit Card deposits recorded in GP, but the bank reports a single deposit amount. 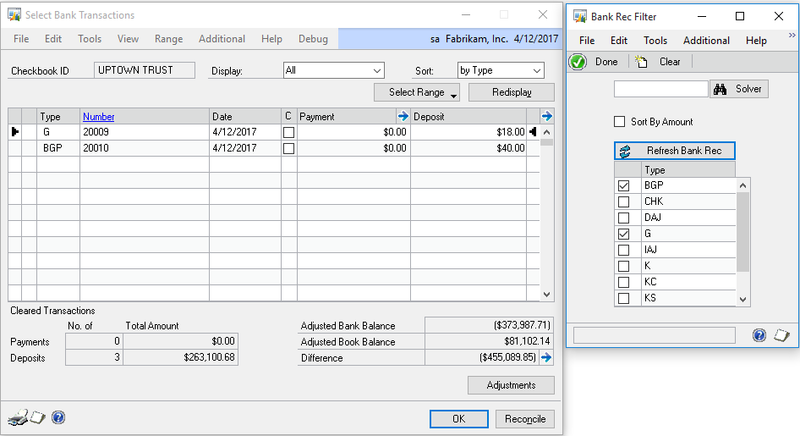 The Excel Solver integration sends the contents from the Bank Rec window out to a Solver template, and launches the Excel Solver Add-In. Solver examines all of the documents to find a combination which totals the amount you specify. 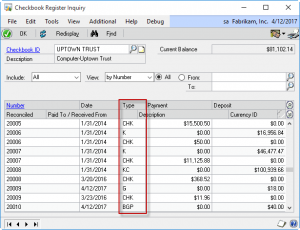 Advanced Filters provide the ability to restrict the Checkbook Register Inquiry window by any of the Type codes. Use the Filters to quickly restrict the window to show only credit card deposits. Additional filters provide the ability to perform a “contains search” on the Paid To/Receive From and Description fields. Auto-Zoom automatically refreshes an open zoom window when you click on a new document. 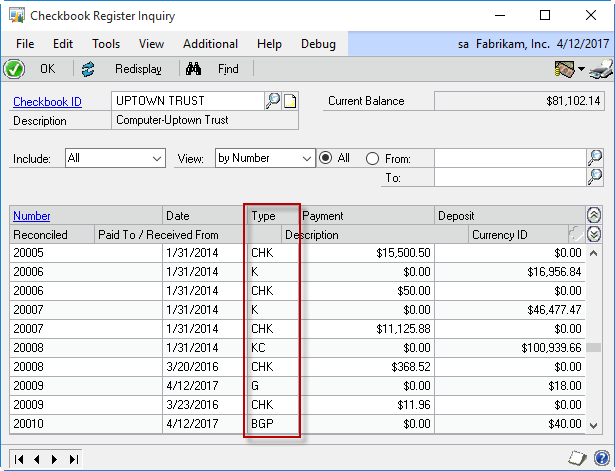 For example, once the Bank Deposit Entry Zoom window is open, each time you click on a deposit in the Checkbook Register Inquiry window, the zoom window will re-display to show the newly selected deposit. This saves a lot of clicks over having to repeatedly select a document then click the Zoom button.